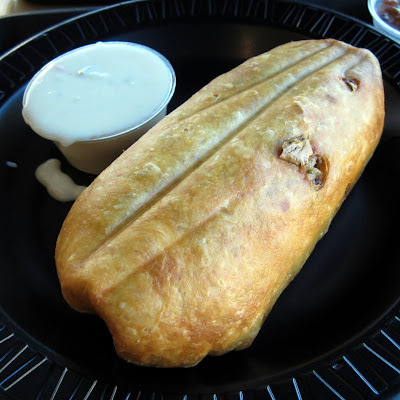 slakingfool: Fried burritos at Bandit Burrito: A chimichanga by any other name. Fried burritos at Bandit Burrito: A chimichanga by any other name. On Wednesday nights Bandit Burrito on Merle Hay Road in Johnston offers the option of deep-frying your customized made-on-the-spot burrito concoction. First, a little background on one of Bandit Burrito's most unique ingredients. I just love their vegetarian chorizo, freshly-cooked per order in a small cast iron skillet. The seasoned, crispy-browned bits give proof that meat analogues done right give as much satisfaction, if not more, than the portion of flesh it supplants. So finally I get an opportunity to sink my teeth into a fried 'Bandit' burrito, and baby, it was everything I hoped for. The crispness of the wrap – Jalapeño Cheddar in this instance – was sublime. The fillings within get a blast of heat from the fryer, coaxing the flavors to seep a little further from their source ingredient. 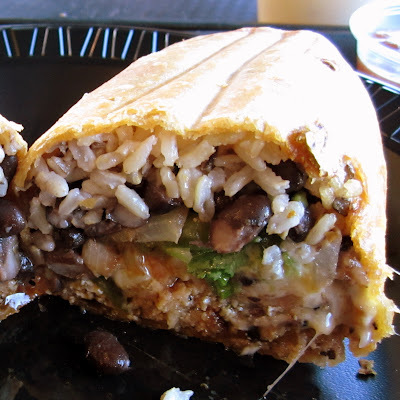 You likely should let your fried burrito rest a bit before you tuck in: it can be quite hot. Fried burritos come with a side of queso. I passed on smothering my burrito under the white sauce in favor of manhandling it straight into my slaking maw. I had ordered some of Bandit Burrito's tortilla chips – along with some salsas and guacamole – and tried the queso as a dip. I found it lacking in flavor and busied myself sampling the rest. The mild salsa is an accurate description, and a little waterier than I prefer. 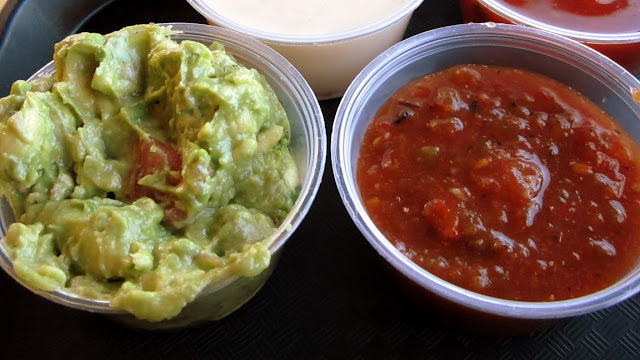 The hot salsa sported a more appealing texture, but what caught my attention was the guacamole. Thick and creamy but speckled throughout with discernible chunks of avocado and tomato, its distinct flavor and texture would be a far more complimentary topping on a fried burrito than the wan queso. I have got to get there and try one of those. Looks fantastic! I still have not tried this place out yet and I've been meaning to. It's just so far out from where I'm at. Since I don't drive I have to harangue someone to get there, so it's not often. Choose Wednesday so you can take the fried option if you like. 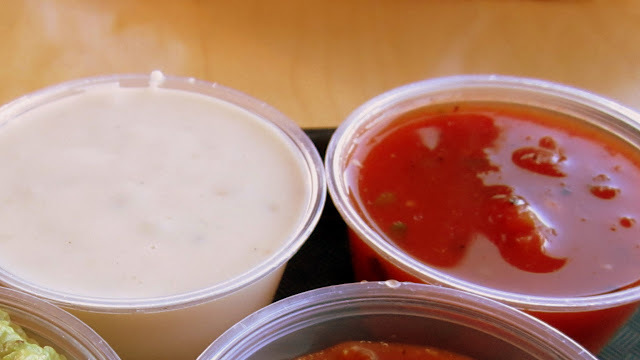 Ask if they can give you something other than the queso for a side.